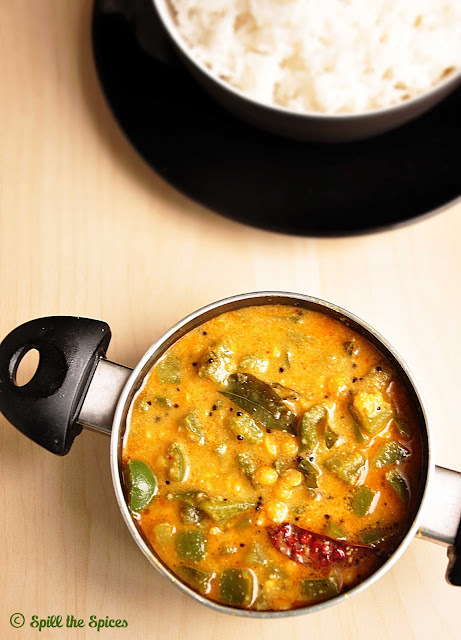 Kootu is a healthy South Indian preparation made with lentils, vegetables and ground coconut paste. 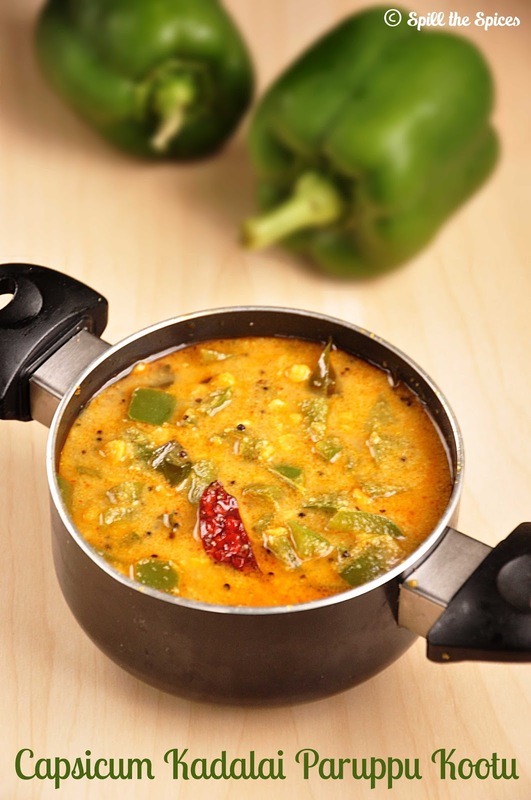 It is a light mildly spiced and tastes best when served with rasam or any kuzhambu. 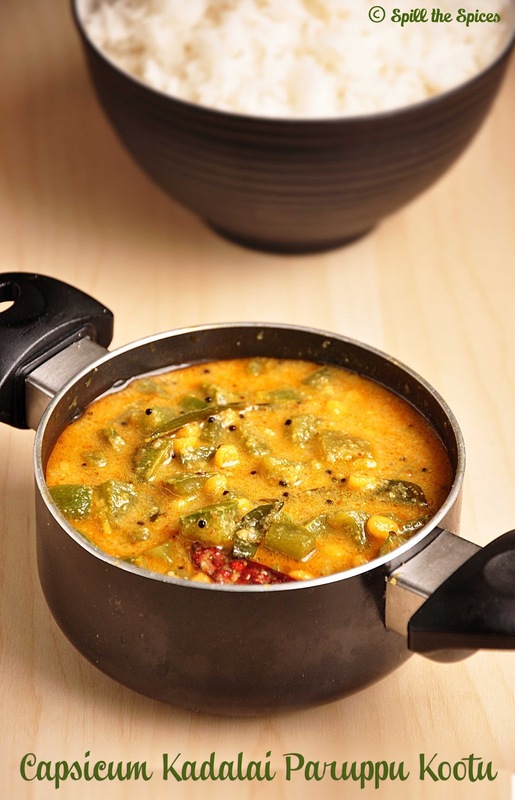 Kootu can be made with any gourd, squash and greens, with either moong dal (passi paruppu) or chana dal (kadalai paruppu). Capsicum is not typically used to make a kootu, but when vegetables commonly used to make kootu are not available, why not try with the ones available. I prepared this kootu following my chow chow kadalai paruppu kootu. Use green capsicum as it has a slight bitter flavor and not sweet like yellow or red capsicum. The kootu pairs well with rasam or vatha kuzhambu. Or you could just serve with plain rice and pickle. It also goes well with chapathi or phulka too. 1. Wash the dal well and add turmeric powder and water just enough to immerse it. Pressure cook for 2 whistles or until its soft. 2. Grind the coconut, red chillies and jeera to a smooth and thick paste by adding little water. 3. In a kadai, add 1 tsp oil and add the capsicum. Fry the capsicum for 2 minutes, then add ¼ cup water and cook till its soft. 4. Add the ground paste and bring to to boil. Boil for 2-3 minutes, then add the cooked dal, salt, little water and mix well. 5. Simmer for 3-4 minutes. In a pan, heat oil and add mustard seeds. When it crackles, add red chilly and curry leaves. Pour over the kootu. Serving Suggestion ~ Rice and rasam / kuzhambu. You can also cook the paruppu / dal in open pan. Soak for atleast 1 hour and add enough water. Once it ¾th done, add the capsicum. The paruppu / dal should not be mushy, it should retain shape and cooked just soft. Yummy and flavourful kootu!! love the vibrant color!! Looks so delicious, this would make a lovely meal! Capsicum kootu sounds so unique and interesting... Looks very delicious dear. wow..looks yummy n healthy too ! Healthy and delicious looking capsicum kootu.. Love the pics.. Innovative kootu recipe Sona.. Looks delicious too.. this will go well with all tangy kulambu..
Yummy Kootu .. my favourite.I always make with different veggies. Capsicum kootu delicious and healthy.. Lovely clicks dear..